Hiring a VW Campervan in the south west of the UK is the best way to tour the West. Devon is a stunning county of great contrasts, from historic houses and cities to beautiful wild countryside and fabulous beaches. The capital, Exeter, is home to fine restaurants, a vibrant new shopping area and of course, the historic cathedral green. To the north of Exeter is the famous Exmoor National Park and the market town of Barnstaple, in the centre of the Tarka Trail – 180 miles of walks covering a wide variety of landscapes, including wooded river valleys, moorland, coastal cliffs and sandy beaches. No visit to Exmoor would be complete without a visit to Tarr Steps and stopping for a bite to eat in the Tarr Farm Inn. A must is also a visit to Lynton and Lynmouth, guaranteed as an escape to those wishing a complete change from the busy pace of modern life. To the south west of Exeter is the wild and wonderful Dartmoor National Park, wonderful walks and hiking with wild countryside and wonderful views. Visit Devon’s most famous moor and you’ll discover a world where wildlife, history and culture come together to create unforgettable Devon holidays. Cornwall is the extreme south-western peninsula of England. It has the longest stretch of continuous coastline in Britain and it is one of the sunniest areas in the UK. With picturesque villages, Celtic ruins, light blue waters, gardens and parks and unique architecture it certainly is among the most scenic areas of England. Home of many events and festivals and the land of the Cornish pasty. It is definitely worth visiting. 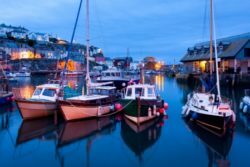 Some our favourite Cornish destinations are the fishing port of Padstow, home of Rick Stein’s famous seafood restaurant and the subtropical paradise of St Ives with palm trees, golden sands and picturesque fishing harbour. St Ives was recently voted best family holiday destination by Coast magazine and one of TripAdvisor’s top 10 European beaches. Of course, Cornwall has its fair share of historic locations to visit, some of them rooted in Cornwall’s dark pirate past. Learn more at the Jamaica Inn & Museum set high up on wild and beautiful Bodmin Moor, made world-famous by Daphne du Maurier’s tale of smugglers, rogues and pirates. Visitors can explore Arthurian legends by visiting the ruins of Tintagel Castle or marvel at the wonders and splendour of the modern Victorian age by visiting Lanhydrock House, with its extensive landscaped estate, perfect for walking the dog! Cornwall has also been used as a filming location on many occasions; Poldark was filmed at many locations in West Cornwall, check out the one day Poldark drive by clicking here, or visit Port Isaac, a vibrant traditional Cornish fishing village where Doc Martin was filmed. We love Cornwall and on our latest trip discovered the amazing independent brewery at St Austell. The brewery tour they offer is a great way to learn about the production techniques as well as to taste some of their less known produce. Highly recommended! Dorset is a beautiful and welcoming destination where you can enjoy a perfect adventure. Dorset boasts a unique range of family attractions and historic castles and houses, try the Moors Valley Country Park which has something for everyone. Set in 1000 acres of parkland and forest you can explore the way marked trails, tree-top walkways and tackle the high wire adventure. If it’s history you’re after, check out the unmistakeable ruins of Corfe Castle which tower dramatically over its picturesque village at the very heart of Purbeck. 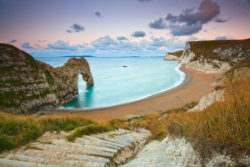 Dorset is home to famously beautiful landscapes, the spectacular views from the Jurassic Durdle Door or visit Weymouth and Portland and walk along the wonderful beach at Chesil and enjoy a spot of fossil hunting at the beach at Lyme Regis, dubbed the ‘Pearl of Dorset’. What comes to mind when you think of Somerset, open countryside with stunning views, sandy beaches, Cheddar gorge and Cheddar cheese, super strawberries and authentic cider? Somerset is famous the world over for the Glastonbury Festival, illuminated carnivals, historic country houses and Arthurian Legends. Somerset is the UK’s seventh largest county and boundaries have changed over time, modern day Somerset takes the historic city of Bath in the east; Exmoor National Park in the west; the historic town of Crewkerne in the south and Portishead, the northern most point on our coast, with its bustling marina and historic Victorian town centre. Why not take a trip on Britain’s longest heritage railway, the West Somerset Railway. Take a steam train from Bishops Lydiard and get off at Dunster to visit the historic Dunster Castle above the old market town. Or, why not visit historic Wells and take a moment to reflect in one of Britain’s oldest cathedrals. 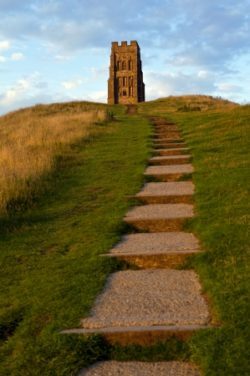 If you feel up to it, take a trip to mystic Glastonbury and clamber up to Glastonbury Tor to enjoy fine views across the Somerset countryside. No trip to Somerset would be complete without a visit to the magnificent Cheddar Gorge and Caves with the chance to sample some delicious local Cheddar Cheese at the many little shops in Cheddar village. Wiltshire has many unique sites to visit and has stood as a special place for a very long time. Two World Heritage sites stand as a monument to Wiltshire’s place in ancient times. Stonehenge and Avebury have a magical quality that has attracted visitors from all over the world for centuries. Romans, Normans and Saxons have all left their mark on the towns and villages of Wiltshire. More recent engineering history can be seen at Swindon’s famous railway museum. The ‘must see’ list for Wiltshire alongside the World Heritage Sites, is the medieval city of Salisbury with its magnificent cathedral, the National Trust’s gardens at Stourhead and of course, the Lions of Longleat. The county is also renowned for the world famous white horses carved into the rolling downs. Over half of Wiltshire’s countryside has been designated an Area of Outstanding Natural Beauty. There are numerous ways to enjoy the quintessentially English countryside, from walking, cycling and horse-riding to fishing, golf, canal boat trips and more. Bristol is a dynamic, exciting city with strong links to the past through its maritime heritage of discovery and trade. Visitors to the city can visit the famous replica of John Cabot’s Matthew, which is moored in the historic Floating Harbour. Just a short walk upstream from the Matthew is Brunel’s magnificent steamship, the SS Great Britain, permanently sealed in to protect her from the elements. Staying with Brunel, no visit to the city would be complete without taking a stroll over Bristol’s iconic Suspension Bridge. Bristol has a unique place in aviation history, it was the historical home of the famous Bristol Aeroplane company and the largest hangar of its age was built to house the ill-fated Bristol Brabazon. But it is arguably most famous for the role Bristol played in developing and building the ground breaking Concorde airliner, the last Concorde to fly can be visited at the Aerospace Bristol museum. The city offers a richly diverse shopping and dining experience, there are many award winning restaurants in the city, which cater of wide range of culinary experiences. During the summer months many exciting events are held in the city, open air music in Queens Square and the Lloyd’s harbour side amphitheatre. Bristol’s yearly Harbour Festival is a fantastic event with nightly live music, food stalls and visiting tall ships and naval vessels, culminating with a fabulous firework display. 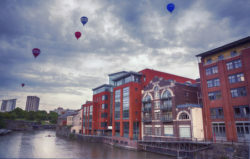 During August, Bristol hosts its world famous international balloon fiesta, the balloons are lit up at night during the Balloon glow and (weather permitting) mass ascents are held every day during the four day event. The internationally famous graffiti artist Banksy is linked to Bristol, examples of his work can be seen throughout the city and each year Bristol holds Upfest, the largest free street art & graffiti festival in Europe. The south west has many beautiful towns and cities, but few can compare to historic Bath. 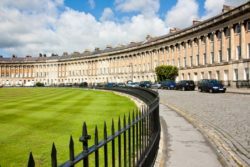 Blessed with some of the nation’s grandest Georgian architecture, the iconic Royal Crescent being the most famous example, most of Bath’s fine buildings were constructed with the distinctive honey coloured Bath stone. Founded on top of natural hot springs, this sophisticated, swanky and up-market city has been drawing in visitors for centuries and is so beautiful it was made a UNESCO world heritage site. Visitors to the city can take a swim in Bath’s famous natural hot springs at the Thermae Spa Bath and visit the world renowned Roman Spa, possibly one of the best preserved roman spa’s in the world. Take a stroll through Bath’s quirky shopping area and be entertained by the many street artists performing or stop for lunch at one of the many boutique restaurants. Alternatively visitors can enjoy a fabulous pint of Bath Gem at the Salamander pub. Jane Austen lived in Bath from 1801 to 1806 and used the city as a location for her novels, visit the Jane Austen Centre to find out more about her life and novels. Just outside Bath, at Claverton is the American Museum, the only museum of Americana outside the United States. It was founded to bring American history and cultures to the people of Britain and Europe.